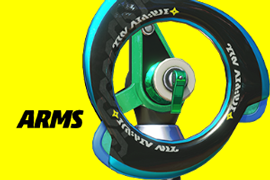 dedicated to the Nintendo Switch game, ARMS. Since May 2017, we've written 358 articles on all things ARMS! The twenty-seventh Party Crash, Brainy Battlers, ends with Mechanica defeating Dr. Coyle by 6%. 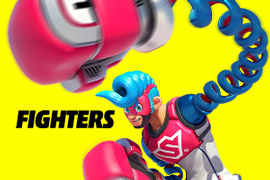 The twenty-seventh Party Crash, Brainy Battlers, (and the eleventh round of the Party Crash Bash) is announced for 2019-04-12. The twenty-sixth Party Crash, Clash of the Quick, ends with Ninjara defeating Ribbon Girl by 12%. 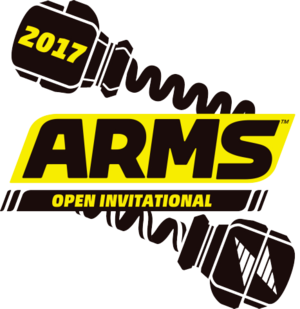 The ARMS Open Invitational was a tournament hosted by Nintendo at their E3 booth in June 2017. Four of the competitors in the tournament were Alex "CaliPower" Valle, Kelsy "SuperGirlKels" Medeiros, Daniel “Tafokints” Lee, and Marie-Laure “Kayane” Norindr, and the rest were four qualifying E3 attendees who visited the Nintendo booth between 10 a.m. and 1 p.m. PT on 2017-06-14. 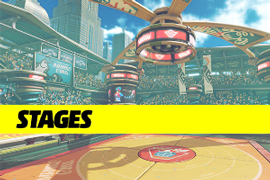 This page was last edited on 13 December 2018, at 04:59.